Anticipating building-related complexities ensuing from occupants' behaviour is a major challenge in architectural design. Conventional building performance simulation tools model occupancy in a highly aggregated form, abstracting away the impact of dynamic spatial and social factors on occupant behaviour. To address this issue, we propose a multi-agent system that accounts for these aspects in process-driven facilities, such as hospitals. The approach involves modelling 'narratives', rule-based scripts that direct occupants' movement and shared activities. A scheduling mechanism employs Operations Research techniques to dynamically coordinate the narratives' execution. 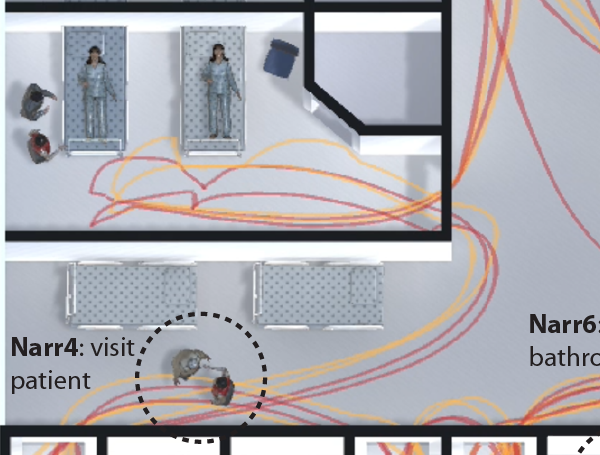 We demonstrate the method by simulating day-to-day operations in a typical hospital setting, involving scheduled procedures and unscheduled adaptations due to dynamic social and environmental conditions. The process involved collecting data using field observations and interviews with experts, modelling narratives, and simulating them to produce use scenarios that can be visualized and analysed by design stakeholders.